The Klein Karoo offers spectacular scenery as you travel from Oudtshoorn to Swellendam towards Cape Town and you go through the towns of Calitzdorp, Ladismith and Barrydale to Montagu. If you travel north and east from Oudtshoorn you pass through De Rust, Meiringspoort and Uniondale. It is a fascinatingly beautiful area, and travellers to this arid part of the country can marvel at spectacular scenery, wild flowers, incredible sandstone mountains and lush vineyards and orchards. The area enjoys a mild climate, especially in winter. There are some stunning mountain passes to drive along, and these include the spectacular Swartberg Pass, the Huisriver Pass, and the Rooiberg Pass. The Klein Karoo Wine Route in the Southern Cape is arguably the most diverse of South Africa’s wine regions. It is the easternmost wine producing region in the country, stretching along Route 62 from Montagu in the west to the Outeniquas in the east. The Klein Karoo is situated between spectacular mountain ranges, and its vines are grown on these high slopes and in the fertile alluvial soil along the river banks. The drier climate of the region contributes to healthy vineyards which are grown organically to a large extent, while various microclimates enable winemakers to produce a wide variety of quality wines – including dry white and red wines, fortified wines (Muscadel and Port) and potstill brandies. 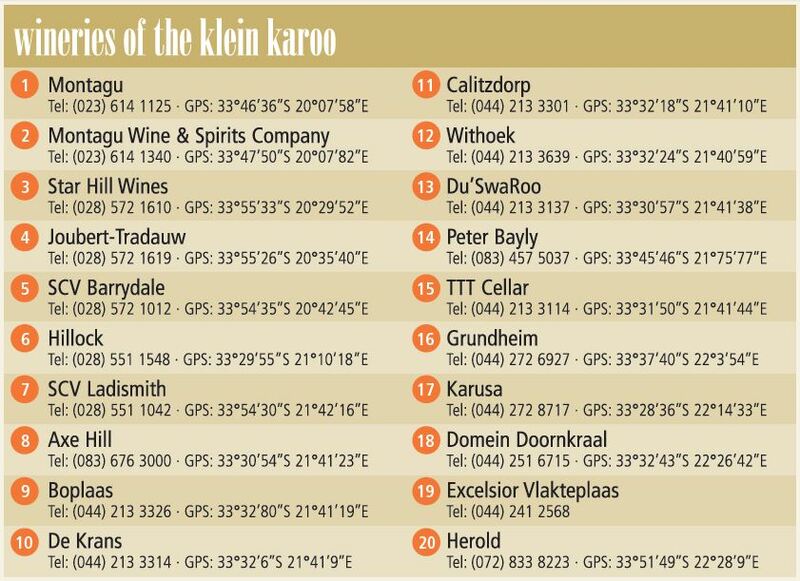 More than just an excellent range of wines, the Klein Karoo Wine Route offers visitors its unique cuisine, the warmth and hospitality of its people and the mystique of its landscape.